Havana-born Nelson Alfonso is the graphic designer behind Selected Tobacco, an ultra-premium outfit that produces cigars under the Atabey, Byron, and Bandolero brands. Even if you’re unfamiliar with these cigars, you’ve almost certainly appreciated Alfonso’s work; his firm, Golden Age Visual Developers, has contributed to the packaging and design of many iconic Cuban brands, including Behike (which explains why Atabey looks so Behike-esque). 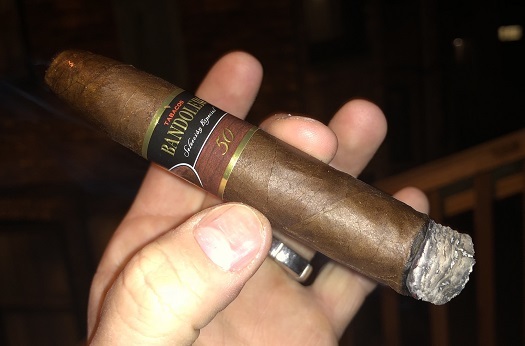 The Bandolero Traviesos has the dimensions of a standard robusto (5 x 50), but it actually smokes more like a shorter, stouter cigar given its long torpedo cap. It retails for $12 for a single. The cigar has a dark, mahogany-colored wrapper with moderate tooth and ample oils. The seams are tight and the veins are thin. Once the well-executed torpedo cap is clipped, I find a smooth cold draw. At the foot, the pre-light notes remind me of molasses. After setting an even light with a couple wooden matches, a woodsy, slightly spicy, medium-bodied profile emerges with flavors ranging from cedar and espresso to black cherry and cocoa powder. The overall first impression is one of harmony, depth, and smoothness of delivery. As the Traviesos progresses, the flavors remain fairly consistent, save for a cayenne-like heat that comes and goes at will, as well as the introduction of a taste I can only describe as natural tobacco. At times, there’s a roasted peanut flavor that’s borderline brilliant—but it’s very fleeting. While the ash holds well and the draw is clear throughout, the burn line leaves something to be desired. I didn’t have to perform any touch-ups along the way, but I certainly thought about using my flame to correct the wavy burn a few times. The smoke production is about average. My experience might have been a little different with the Traviesos, but my conclusions are identical. I award this cigar three and a half stogies out of five.